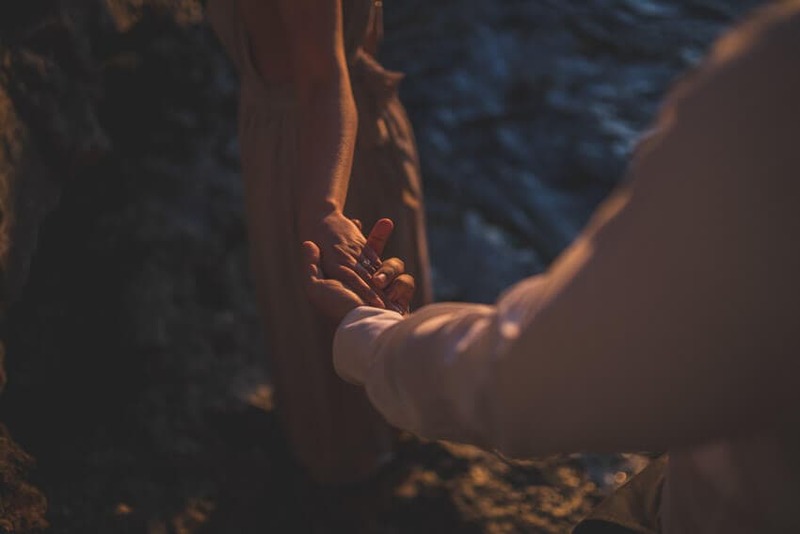 As engagement shoots have become more popular, so has the idea of traveling to exotic locations to capture romantic photos. Lucky for those of us in Ontario, you don’t have to travel very far. At a 3 hour drive, Torontonians can arrive at Tobermory, a small town at the northern tip of Bruce Peninsula. 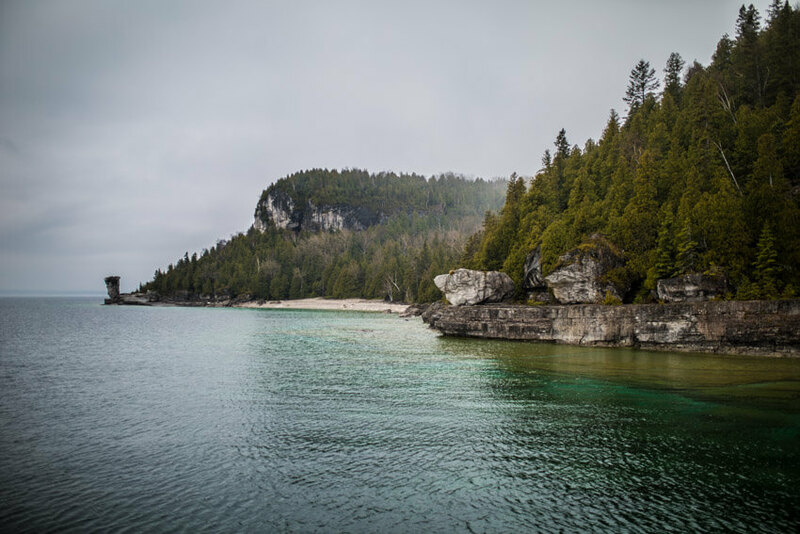 A popular vacation spot, Tobermory straddles Lake Huron and Georgian bay, features a national park, and offers peace and quiet away from the city. We were captured by the spell-binding beauty and adventure that lay ahead of us at this location. 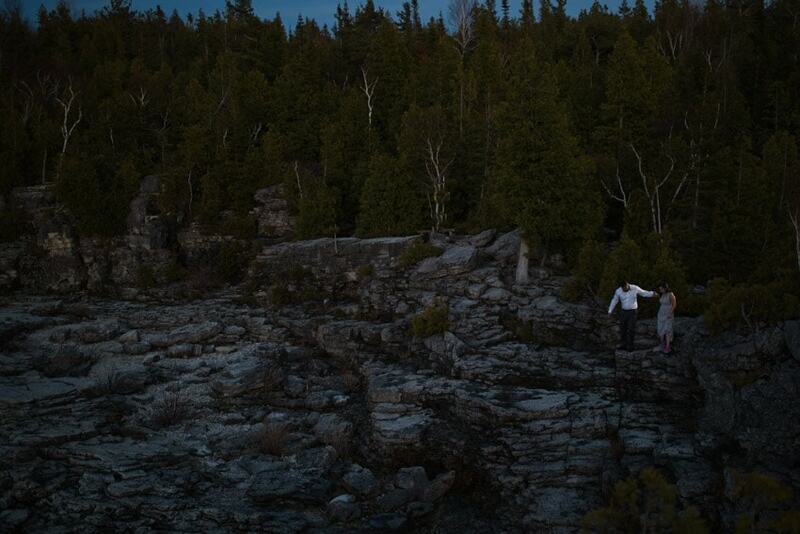 The Grotto (in the Bruce Peninsula National Park) is a popular destination for hikers and nature-lovers. However, it’s not a location where you see a lot of photo shoots – and for good reason! A beautiful cave carved out by the waves featuring clear, turquoise water, the Grotto is at a steep 30-minute hike! 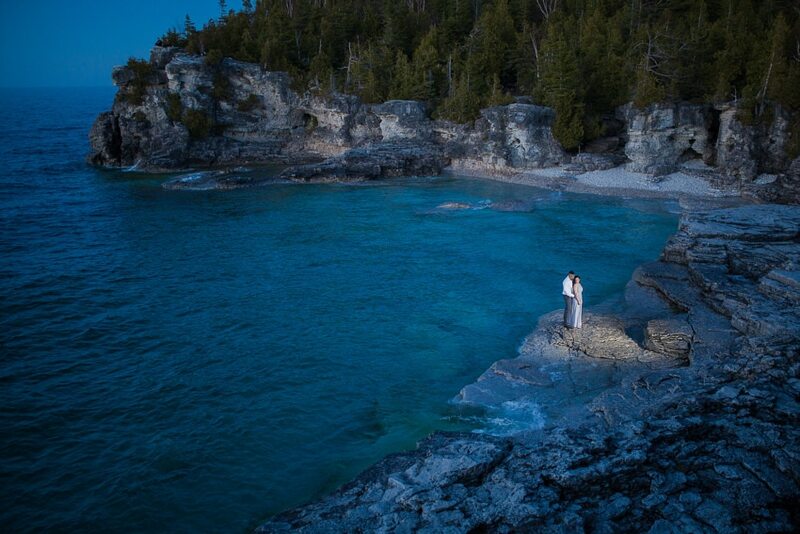 We were lucky to be working with what we call a “Hell Yeah!” couple – a couple who put all their trust in our vision and followed us out to the edge of the water for an unforgettable experience and incredible photographs. Initially, our beautiful bride-to-be was a little hesitant, after all, a steep trek is already a challenge without a long flowy dress to worry about! With some encouragement and support (and the strength of her future husband by her side), she made it! This location was quite the challenge as a photographer as well; the hike was made even more difficult with all the equipment. So instead, we grabbed our camera and opted for the natural light from the oncoming sunset. We didn’t need much as for the extraordinary view of crystal clear water surrounded by ragged rock 50 feet below the mainland. As a photographer, it is exciting to be able to overcome challenges. 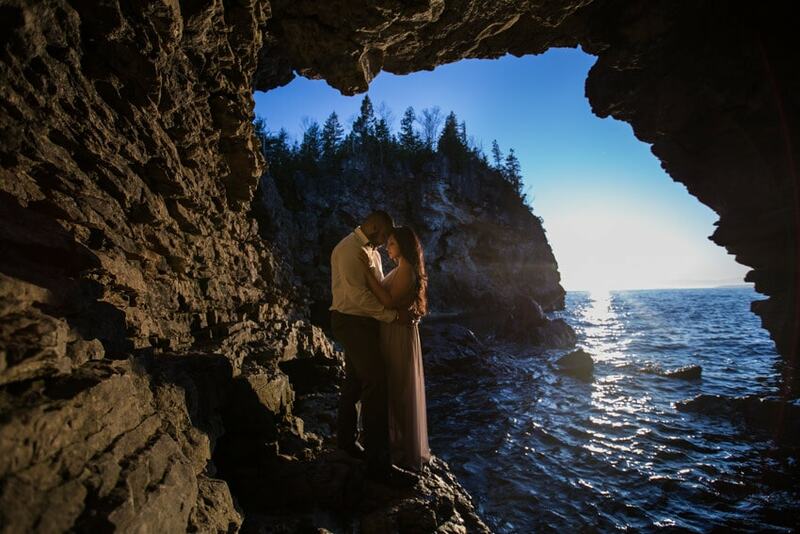 This shoot required us to get physical embrace the rough terrain, and to make use of nothing but the natural light! 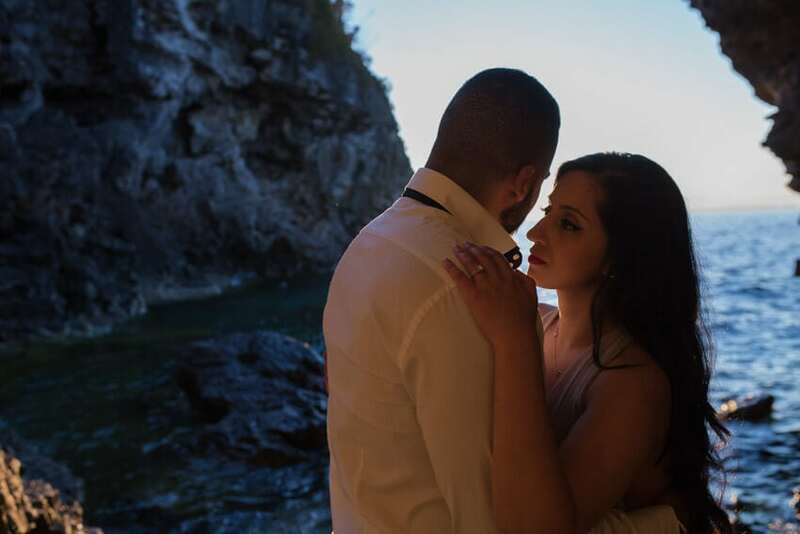 We were honoured to have the full trust of our couple to let our creativity flow and take these shots which are not only beautiful images, but a wonderful journey and story to be shared.